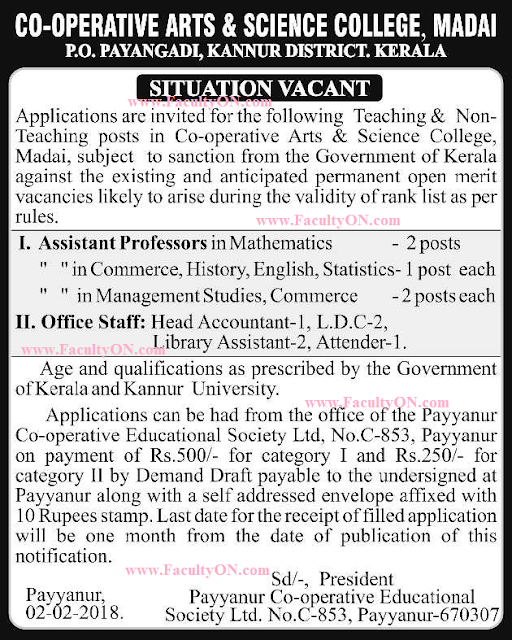 Co-Operative Arts & Science College, Kannur has advertised in THE HINDU newspaper for recruitment of Teaching Faculty- Assistant Professor Plus Non-Faculty jobs vacancies. Interested and eligible job aspirants are requested to apply within 30 days from 07th February 2018. Check out further more details below. About College: Co-operative Arts and Science College, Madayi was formally inaugurated by the then Minister for Education Sri.T.M.Jacob at a ceremonial function presided over by the then minister Sri.K.P.Noorudhin on 21st December 1982. The college initially began to function in the Madrasa Hall made available by the Ahammadiyya Jama-ath- Committee,Madayi. Application Fee: Rs.500/- for Assistant Professor and Rs.250 for others. 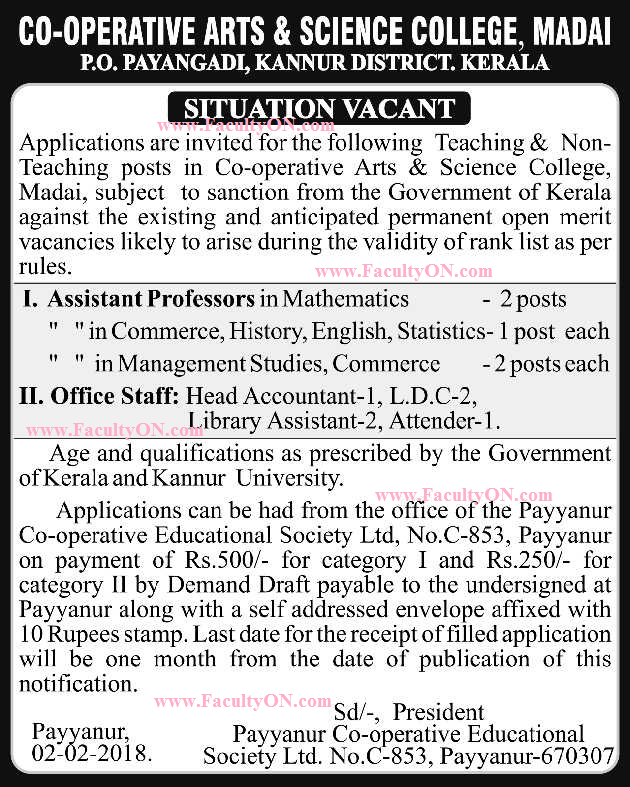 Fee should be paid as DD drawn in favour of The President, Payyanur Co-Operative Educational Society Ltd, Payyanur-670307 and send it along with Rs.10 stamp affixed self-addressed envelope. How to Apply: Interested and eligible candidates are requested to send applications in the application form purchased by paying the fee along with required documents to the postal address provided below.